In the race to replace retiring U.S. Rep. Jeb Hensarling, R-Dallas, mail pieces making the rounds don't mince words about the financing behind his would-be successor, Bunni Pounds. She’s "For Sale," they say, citing her support from a big-spending super PAC. "Don’t let Bunni Pounds sell our seat in Congress." The clear theme: The former Hensarling fundraiser is a creature of the Washington, D.C., "swamp" who’s trying to buy her way to the halls of Congress. One small detail you won’t find in the advertisements: All of the disclosed funding from the super PAC behind them can be traced to a single donor who has faced his own accusations of buying influence over the years. His name is Monty Bennett, and it’s not even a little surprising that the Dallas hotelier wants to defeat Pounds. Her opponent in the May 22 GOP runoff election is state Rep. Lance Gooden, R-Terrell, who passed special interest legislation benefiting Bennett's East Texas ranch while receiving over $100,000 in campaign donations from him, records show. Gooden’s personal financial statement on file with the Texas Ethics Commission also shows he owns a small slice of Henderson County property with Bennett. Campaign records show Bennett and his MJB Operating LP have given Gooden at least $140,000 for past legislative races, making him Gooden’s largest individual donor. With the congressional race, Bennett’s critics are seeing a familiar pattern come to a head. Andy Jones, a small business owner who’s clashed with Bennett over property in Henderson County, said Bennett “throws money at everything” to get his way — and questioned whether he would have disproportionate influence over Gooden if elected to Congress. "That makes me wary because that’s how he works — he buys folks," Jones, a Pounds supporter, said of Bennett’s history of giving generously to Gooden. "I’m afraid with so much money coming from one person — that those votes won’t be straight-up fair." Bennett says it is "just silly" to think he uses money to buy politicians — but does not shy away from his support for Gooden. Bennett has been the driving force so far behind Our Conservative Texas Future, a super PAC that has spent over $388,000 in the 5th District race, roughly half supporting Gooden and half opposing Pounds, according to Federal Election Commission records. Its only disclosed donations to date are $100,000 from Bennett’s Dartmore LP and $5,000 from Bennett himself. A person familiar with the group said it has also received money from Andy Beal, a billionaire banker from Dallas, and his contributions should show up on its next monthly filing. That report is due Sunday — two days before the election. In addition to fueling the super PAC, Bennett has given the maximum amounts to Gooden's campaign — $2,700 each for the primary and the runoff — as well as signed off on fundraising appeals and helped host fundraisers. To be sure, Pounds is also benefiting from an infusion of super PAC money in the race. The Club for Growth, an aggressive player in GOP primaries across the country, has spent over $463,000 in the 5th District race through its super PAC, almost all of it attacking Gooden, according to FEC records. The Club for Growth endorsed Pounds the day after the March 6 primary, when she finished 8 percentage points behind Gooden in the eight-way race. Pounds has had the endorsement of Hensarling from the start of her campaign and she picked up another high-profile supporter in the runoff: Vice President Mike Pence, Hensarling's longtime friend and former U.S. House colleague. The solidly red district includes seven counties sprawling southeast from Dallas. Bennett’s Henderson County ranch in deep East Texas has been at the center of a long-raging controversy pitting Bennett and Gooden against the Tarrant Regional Water District in Fort Worth. Bennett’s 1,000-acre Lazy W Ranch sits in the proposed path of a $2.3 billion, 150-mile pipeline that will carry water from East Texas to Dallas-Fort Worth, according to court documents. Less than a year after the water district sought to enter Bennett's property to conduct a survey, Gooden quietly pushed a bill through the Legislature that helped Bennett fight the Tarrant Regional Water District's efforts to condemn a piece of his land for its pipeline. The 2011 legislation, HB 3864, created the Lazy W District No. 1, a municipal utility district which court records say is comprised entirely of Bennett’s ranch. That has allowed Bennett’s Lazy W to assert “immunity as a governmental entity,” according to a Texas Supreme Court decision that took his side in a procedural fight in 2016. In an email, Bennett said his and Gooden's joint ownership of an acre in Henderson County had “nothing to do” with the Lazy W District No. 1. Bennett is the president of the board of directors, state records show. 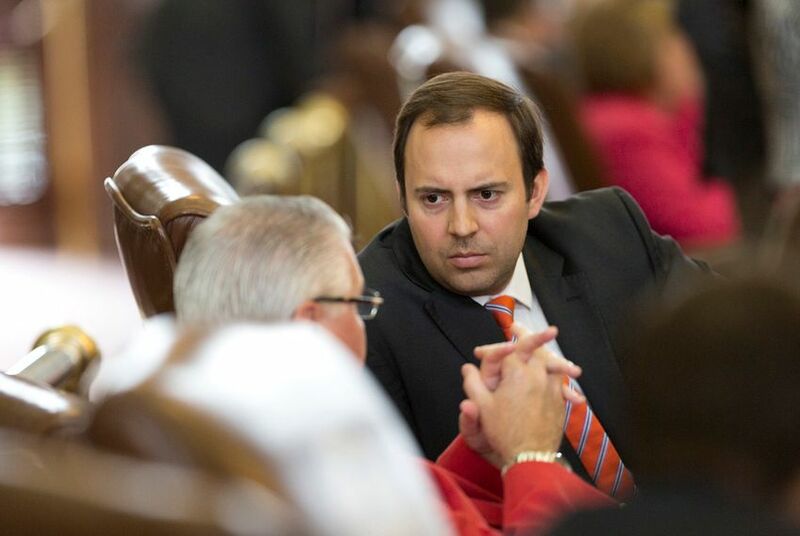 After creating the district, Gooden went to bat for Bennett in his battle to get records from the Tarrant water district, citing his prerogative as a member of the Legislature in 2014 to receive information — including “confidential information“ — as long as it’s used for legislative purposes. Gooden’s campaign declined to answer a list of questions for this story, including why he owns property with his largest legislative donor and whether he thought Bennett would have undue influence over him if he gets elected to Congress. The campaign instead provided a statement from Gooden. “I have widespread support from the grassroots and long-standing conservative activists in this district, and I’ve always maintained an open door policy for all of my constituents," Gooden said. "I've always held myself to the highest ethical and moral standards, and I will continue to do this as I fight for conservative Texas values in D.C."
While Bennett's ranch is in Gooden's state House district, Bennett is registered to vote at an address far away in Dallas, according to records from the secretary of state's office. His state representative is Dallas Republican Morgan Meyer.